The 2018 Nissan Rogue is now available at All Star Nissan in Baton Rouge, LA. For the 2018 model year, Nissan installed some advancements in the Rogue family lineup. Notable additions include LED Daytime Running Lights, LED Taillights, available roof rails, and power heated outside mirrors. Experience these systems and more in person, schedule your Nissan test drive at All Star Nissan today! Starting with the Rogue S, drivers will enjoy a new crossover that offers seating for five, 170 horsepower, twenty-six miles-per-gallon in the city and thirty-three on the highway. Notable features include LED Daytime Running Lights, RearView Monitor, Blind Spot Warning, Rear Cross Traffic Alert, and Forward Emergency Braking. Moving into the SV, we find the same performance numbers as the S along with the addition of 17" Aluminum-alloy wheels, Nissan Intelligent Key® with Push Button Ignition. Other notable features include Remote Engine Start, Dual Zone Automatic Temperature Control, and a 6-way power driver's seat with power lumbar. The Rogue Midnight Edition includes the SV's features and adds Exclusive Midnight Edition black 17" alloy wheels, Black roof rails and crossbars, Black outside mirrors with LED turn signal indicators. The 2018 Rogue SL offers the SV's features as well as Motion Activated Liftgate, NissanConnect℠ with Navigation, Mobile Apps, and Services, Around View® Monitor with Moving Object Detection, and Leather-appointed seats. If you are looking for more horsepower and better fuel economy, the SV Hybrid is the new crossover for your garage. With 176 horsepower, this Hybrid SUV delivers thirty-three miles-per-gallon in the city and thirty-five on the highway. Some noteworthy features include Engine Idle Start/Stop, Energy Flow Gauge, and Underfloor cargo storage. The top model SL Hybrid offers Motion Activated Liftgate, NissanConnect℠ with Navigation and Mobile Apps, Around View® Monitor with Moving Object Detection, and Leather-appointed seats. After you decide on the trim options that suit your driving needs, let our sales associates review warranty options and Rogue financing options. 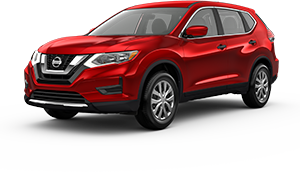 Visit our new and used Nissan dealership in Baton Rouge, LA, to introduce yourself to the 2018 Nissan Rogue. We are eager to help you find the new Nissan crossover SUV you need to increase your versatility and convenience needs. Make the short drive from Prairieville and Denham Springs to All Star Nissan soon!